Q. Please tell me a little bit about yourself. Hello everyone, my name is Shekira Thompson and I’m from Barbados. I majored in economics while at UWI. I plan to study international business and development during my masters’ courses at Sophia. 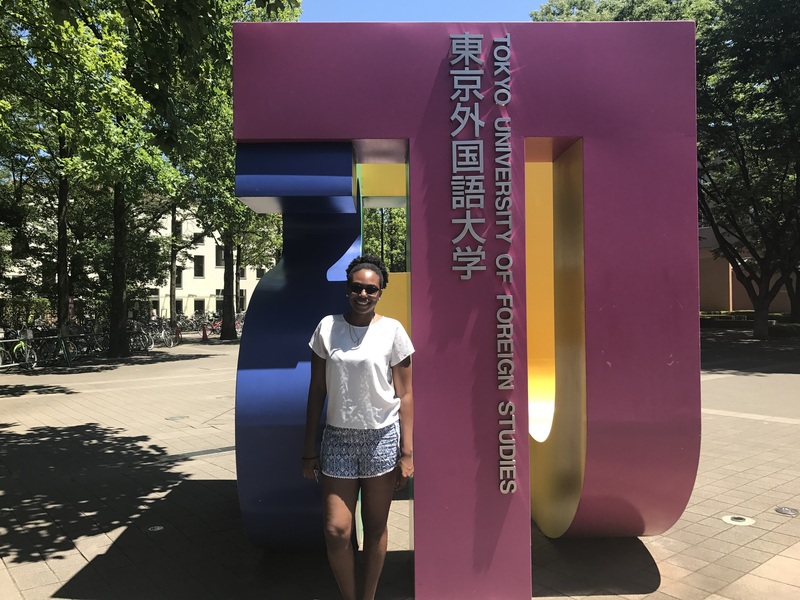 I was able to receive funding from the Ministry of Education to study in Japan after submitting my research proposal on resource economics in developing countries in the Caribbean region, and I have just finished taking short-term intensive Japanese language classes at Tokyo University of Foreign Studies. Q. What prompted you to participate in APIC’s Pacific and Caribbean Nation Student Invitation Program in 2016? I first received an e-mail from one of my professors at UWI asking why don’t I try studying Japanese? I had never studied Japanese before, but I had watched the anime NARUTO, and I was interested in the language so I very happily took the opportunity to come to Japan. Through this I was able to participate in APIC’s program, but at the time Japan didn’t have an embassy in Barbados, so I had no idea what to expect. A few weeks later my professor told me that I had been accepted to the program, and although I was nervous I knew the program was a good one, so I decided to go through with my decision. I wasn’t very familiar with Japanese culture at the time, but I did know that it was one of the biggest economies in the world, and we had also learned about Abenomics in class, so I was curious to learn more about Japan. Q. Do you feel anything changed after participating in the program? I think that there was a big change within me after participating in the Invitation Program. Before participating, I wasn’t considering Asia at all for my Graduate studies, but just like most other Barbadians I was thinking of going to England to study. However, after coming to Japan and realizing what a great university Sophia is, I started to think that going to graduate school in Japan might not be a bad idea. When I came back to Barbados, a friend told me about the Japanese Ministry of Education’s scholarship program, which I then applied to. Before the Invitation Program, I wasn’t even considering going to China to study, which in Barbados is the major Asian country. I think that the biggest proof of me changing is my choice to study in Japan. Q. About how long after graduating from UWI did you decide to study in Japan? I made my decision after coming back from the APIC Invitation Program, so about two months after graduating. Q. What was your biggest reason for choosing a Japanese university graduate program? Most students in the Barbados majoring in economics usually go to America or England for their graduate studies. However, my field is practical economics, so completing my studies in Japan makes more sense for me. The size and the amount of funding is limited in the Caribbean nations, so space-wise and money-wise sustainable resources are not being used to their full capacity. Japan is very skilled at manufacturing, especially at miniaturization and making things more efficient. The biggest reason why I wanted to study in Japan is to see and gain knowledge first-hand about how Japan will continue to make their products cheaper, smaller, and more efficient. Additionally, since Japan is not an English-speaking country I find it very unique, and I’m glad I chose Japan because I have the ability to experience a completely unknown culture to me. For example, Barbadians are not very conservative where Japanese tend to be very conservative. Also Japanese people are very kind, whereas Barbadians may not be. Q. How did you get the chance to study in Japan this time? I was able to study this time thanks to the Japanese government scholarship; however, it was a long and difficult process to be able to receive the scholarship. Once I came back from the Invitation Program I started right away on getting all the necessary documents ready to apply for the scholarship. I passed the requirements, and I was able to start my studies at my first choice of schools, Sophia University. Q. How do you find living in Japan? In the beginning it was really difficult. I really missed my family and home food, but lately I’ve begun to get used to Japanese life. All the stores close down at night in Barbados, so it’s really helpful to have stores open at night here. Q. Is the path that you decided to take quite different from other students at UWI? What was the response from your friends and family when they heard your plan? Yes, the path I chose is quite different from others. I don’t know of any other UWI graduates who are studying in Japan. However, I do know that since I’ve come to Japan, there are other UWI students who are also interested in studying in Japan. Most students go to North America or Europe to study, and if they choose Asia they almost always go to China. After coming to Japan and living here for a bit, I really like it, so after wondering why more Barbadian students haven’t considered Japan before, I think it’s simply because there isn’t enough information about studying here. My mom told me that awareness about Japan has risen since I received the Japanese government scholarship to come here. When I decided to leave Barbados and come to Japan to study, my mom was really worried. She didn’t know that Japan was a part of Asia, so in the beginning she had a hard time with the time difference between Barbados and Japan when calling me. After a bit she was proud of me for leaving my country and going far away to a new adventure. I had never lived away from my home before coming to Japan, so both my mom and I thought that this was a good opportunity for me to grow. All my friends were really shocked when I first told them that I was going to Tokyo to study, and wanted to know “why Japan? !” Like I said, only China comes to mind when you say “Asia”, so Japan is not as well-known. I convinced those friends who had doubts, and now they do things like send me newspaper articles with me in them, showing me support and being proud of me. Q. Can you please tell me what your goal is while you are studying in Japan? On top of getting my master’s degree, I want to be able to speak Japanese and be able to be independent in Japan. My goal for Japanese is to pass the JLPT (Japanese language proficiency test-level 1 is the highest level) level 2 while I am here. Q. Can you please tell me a bit about your current goals for the future? I am thinking of getting a doctorate degree after working at an organization dealing with developmental purchasing (income generating activities) or fund collection, learning first-hand about design, essential elements, decision-making, etc. Another goal for the future is to learn more about development, renewable energy, and a “green economy” and after gathering experiences, I want to take those back to Barbados and help contribute to the development of my country. Q. Currently how well-known is APIC’s Student Invitation Program at UWI? Compared to the time when I applied for the program a lot more students are eager for the chance to study abroad for a month. Hopefully this will pave the way for more students who are interested in economics to come and study in Japan.